A crack here and there does not exactly mean that a concrete slab needs to be replaced immediately. An expert needs to be called in to check the slab and determine the cause. Unless it has something to do with the subgrade or steel foundation, a replacement is not necessary. For minimal and surface-deep damage, concrete overlays can do the trick. It effectively covers up any damage or blemish and gives the slab a new and more durable surface. Property owners know how frustrating it is to have to stare at, let alone walk on damaged concrete surfaces. It’s a reminder that one needs to spend for concrete surface repairs. While it would indeed cost something to update or improve its appearance, it does not have to be expensive. Overlays can significantly transform surfaces without breaking the bank. Stamped Overlays – This overlay is so versatile that it can be made to look like any high-end surface, like flagstone, brick, or slate. The stamped patterns create a slip-resistant surface that makes it ideal for patios, pool decks, and driveways. Spray Knockdown Texture – This knockdown texture is great for property owners who want to have non-skid pool decks or any outdoor surface with a more subtle appearance. Using a hopper gun, the acrylic concrete floor coating is sprayed down on the slab and knocked down to create a cool and spray textured surface. Epoxy Flooring – Popularly used on garage and basement floors, epoxy coatings provides a tough and durable surface that can endure almost any damaging element. This can only be used indoors because of its sensitivity to the sun’s UV rays. Why replace when you can resurface with overlays? Call (773) 377-8976 for more info. It is important to find a reliable Chicago decorative concrete resurfacing installer who can efficiently install overlays on concrete surfaces. We at Chicago Concrete Resurfacing know that you deserve one so we made sure that we only hire the best people and train them well to surpass your expectations. 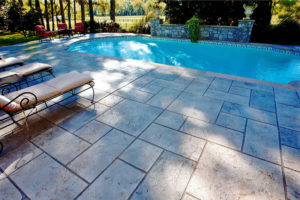 For over 20 years, we have resurfaced pool decks, driveways, patios, and other concrete surfaces, both indoors and out. Check out the concrete overlays we have available for you. Pick up the phone and call us. We would love to provide you with a free consultation and quote.